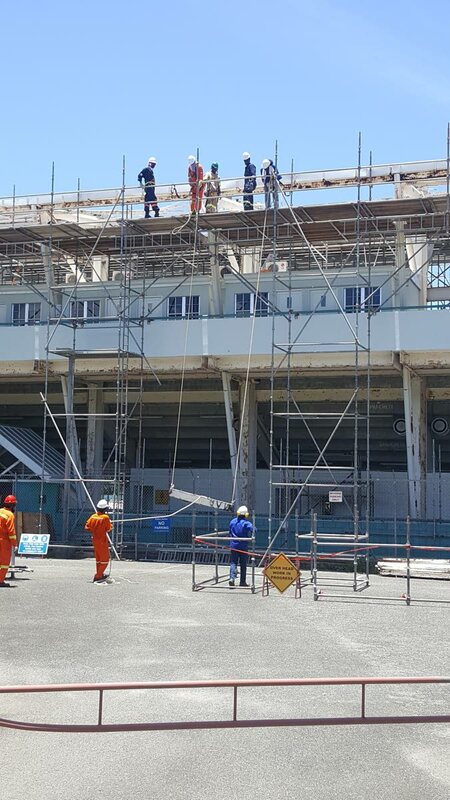 Workers work on removing the roof of the Dwight Yorke Stadium in Bacolet in August 2018 during a first phase of renovation works. The second phase of renovation works at the Dwight Yorke Stadium in Bacolet should be completed by the end of this week, leading into a third and final phase of repairs. So reported Sports Secretary Jomo Pitt at last Friday’s post Executive Council media briefing at the conference room of the Division of Tourism, stating that “we have been given the assurance by UDECOTT (Urban Development Corporation of Trinidad and Tobago) that this particular phase should be completed by weekend. “They have been targeting a date of January 14, we were told by the Track and Field Association that that date should be the first event at the facility. So, they are targeting next (this) weekend that the facility should be available for use,” he said. Pitt said this second phase of works includes repairs to the stadium’s roof, plumbing and electrical works, repairs and servicing of air-condition units and attention to Occupational Safety and Health (OSH) issues. He said a third phase would focus on field lights, tower lights and the sewer treatment plant. Pitt also announced that the gym at Shaw Park gym was to be reopened last weekend. “We are scheduled to have a meeting with the Tobago Athletic Committee, who are primarily the main users of the gym, to work out a schedule and the usage, who would have access to the gym. “I want to make it abundantly clear that it is not a public gym. One of the criteria is that you have to belong to a club or organisation to have access to the gym. And that club would designate who are the athletes that would have usage,” he said. Pitt also reported that tenders have closed for the provision of consultancy services for a feasibility study on an indoor sporting facility at Bacolet. “It has been on the cards for a while… we’re now off and running. We have received tenders from individuals for the feasibility study. “One of the things we want to ensure is that the facility we build caters to the needs of the sporting fraternity on the island but also cater to the maintenance aspect of it. A lot of times we have these facilities but we can’t maintain them… what was recognised is that indoor facilities, the maintenance aspect or the cost of it is usually covered by the ancillary units affiliated to the facility - a gym, a dance studio, things that would generate an income which can offset the use of the indoor facility. “We expect that study to be completed by the end of May, coming out of that study, would influence the design of the facility,” he said, adding that he anticipates that construction could be completed by the end of the year. Pitt also reported on other projects in train, specifically the Cyd Gray Cultural and Sporting Complex in Roxborough and the pavilion at the Goodwood recreation ground. “The Roxborough/Cyd Gray Complex… Currently, the roof repair is ongoing, it should be finished by the end of this month. Once that repair is done, we have the sheeting of the facility and that should eb completed by the end of February. “The Goodwood pavilion, because we had to relocate or move the original side of the facility from the road side, there had to be a redesign. We anticipate that this should be completed within the middle of next month, February, after which we anticipate construction to start by the middle of March and completed by the end of September,” he said. He said work on installing lights at the Plymouth recreation ground and hardcourts, and the Goodwood recreation ground should start “at the end of January and completed by the end of February. It should take one month”. For works on fields at Speyside and Charlotteville, Pitt said the repairs would have to be retendered. “We only got one tender, but we want to make it a little more competitive, so we expect that to go out within the next week or two, but we still anticipate that all repairs should be completed by the end of February, early March the latest,” he said. Reply to "Pitt: Stadium ready for use this weekend, Shaw Park gym reopens"